An American Point: I know, as a civilian, I could never understand the psychological effects brought on by the harsh reality of war, and this film gave me a glimpse. But the film’s brand of patriotism seems a bit superficial, calculated. It is a manipulative demonstration, a disservice to the lives of these real life fallen heroes who never deserved to be utilized as marketing ploys under the false premise of artistic pursuit. 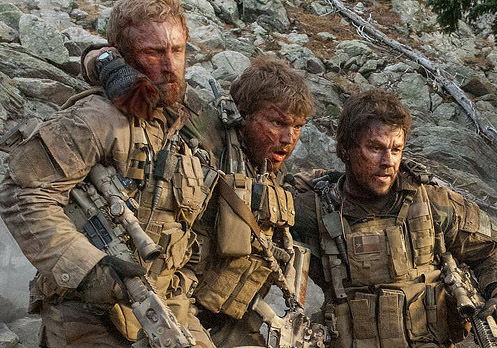 The Problem: By presenting us with real shots of seals banding together, and later by displaying their open willingness to put themselves in danger, Lone Survivor succeeds only in showing us the brutal murders of these brave soldiers rather than showing us who they were as men. Director Peter Berg (The Kingdom, Hancock) was more focused on how they died as he inelegantly depicts the sad end of each soldier. The shocking slaughter of Axe (Ben Foster) is particularly jarring. We see Axe roll against a tree, his final effort for survival. An enemy pulls up his rifle and shoots. The bullet takes Axe in the forehead. His lifeless battered body falls and lies against the tree. It leaves us shattered. Imagine being the family members of that specific person and having to watch that horrific incident unfold. The dreadful dialogue between the men before the battle tells us that Berg was more focused on shocking us with their deaths rather than reliving their hardship and honoring them as soldiers. Why show us how gruesomely they were brought down? Take us through their triumphs and show us who they were. Then, subtly, show us their outcome don’t burn it into our eyes and don’t paint us a graphic image of their final moments. Paint us an image they deserve. The Rest: The performances of Mark Wahlberg and Ben Foster are commendable and capture the true spirit of soldiers. Wahlberg and Foster both trained with real Navy Seals to capture the true essence of these warriors. The other performances are hollow in comparison. Taylor Kitsch’s uninspired reaction to the mission becoming compromised damages the genuine feel this film was going for. Overall: This story is very enthralling, showing us the chilling side of war and how valiant these men were in shocking, real life circumstances. Even as the focus of the film shifts to the highly stylized slayings of the soldiers, it brings to light what these men went through for their country. Berg did not show us the courage of these men. Instead we are left with graphic imagery in place of what could have been a well told, coherent storyline. Travis loves Sci-Fi movies. Travis loves craft beer.Travis loves the Sacramento Kings, who were cheated in 2002. The Book of Mormon (the musical) changed his life.